The Battery lies under the slopes of Signal Hill in St. John's. Archival and anecdotal evidence indicates that rockfall is frequent in this area, and that several avalanches have occurred. Based on original archival work this area was selected for further study, and a series of site visits and interviews took place, in collaboration with students at Memorial University. 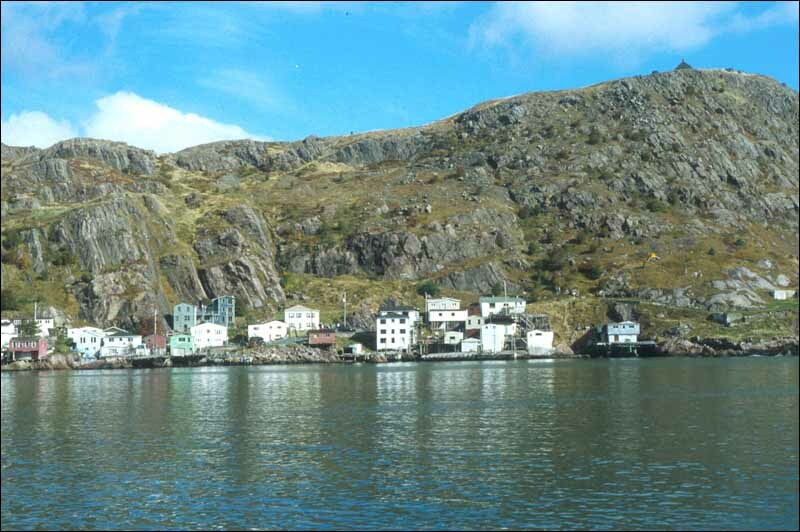 Situated at the entrance to St. John's Harbour at the base of the steep slopes of Signal Hill, the Battery has experienced several fatal avalanches and rockfalls. Reproduced by permission of the Government of Newfoundland and Labrador © 1995. The first known avalanche took place on February 8, 1921. The avalanche hit the house of Alfred Wells and family, moving it 3 m down slope, ripping off the top storey, and driving the roof down into the room where the Wells family was sleeping. Mr. and Mrs. Wells were pinned in their bed by the falling roof. Mr. Wells, despite having his ribs broken, was able to extricate himself, and rescue their two-year-old son, whose crib was crushed. He returned to free his wife, who had severe back injuries, and to rescue another infant (Geneva) who had nearly smothered under the snow. Numerous other unoccupied summer homes were either destroyed or severely damaged. A second incident occurred 10 days later when Albert Delahunty was killed in an avalanche. His body was found 70 m below his house on Signal Hill, and according to the Evening Telegram report, "his hold on a dinner pail had not relaxed when death overtook him". The location of Delahunty's house is uncertain, but was likely close to the Queens Battery, where no current dwellings exist. He had left the house to walk to work in the midst of a fierce storm, and it seems likely that he lost his way, possibly triggering an avalanche by breaking though a cornice. There are no records of further avalanches until 1959, when a storm hit St. John's on the night of February 16, with winds reported up to 220 kph, dumping 55 cm of snow. At 1:05 a.m., residents in the Outer Battery heard a sound described as louder than a clap of thunder. An avalanche struck two houses sweeping them downslope. The houses, belonging to the families of Clarence Wells and Jim Piercey, contained 14 people. Five people were killed and several injured, including Shirley Noseworthy, rescued after being buried for 12 hours. Elsewhere in the Outer Battery, 11 members of the Garland family were buried by what was apparently an earlier avalanche, and they were trapped until dug out by rescuers. Fortunately, the house was able to withstand the weight of snow, and no injuries occurred. Reproduced by permission of Shirley Eales © 1959. Since the 1959 avalanche, no serious incidents have occurred in the Battery, although residents have reported minor rockfalls and avalanches. In 1960, another major storm hit St. John's in early March and definitely one, possibly two, avalanches occurred in the Battery, with no injuries. 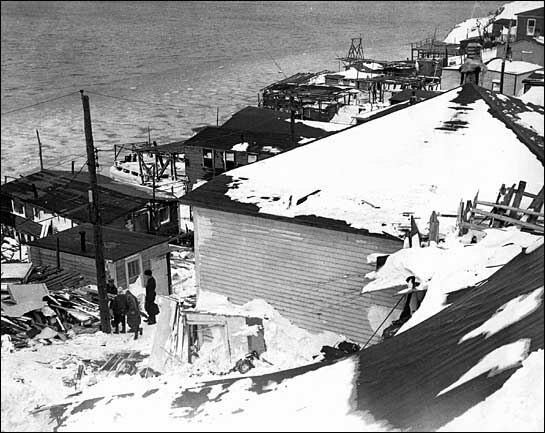 In 1987, an avalanche ripped the porch from the side of a house in the Outer Battery, and residents had to be dug out. Recent concern amongst residents is related to rockfall. 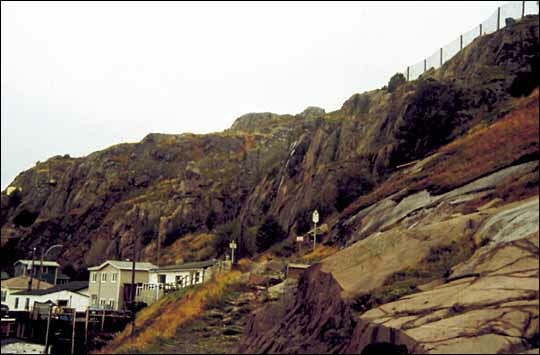 The development of Signal Hill as a historic site, and the promotion of the North Head walking trail resulted in increased foot traffic on the steep, unstable slopes above the Outer Battery. Residents believe that several rockfalls were triggered by people on the slope above. A preliminary inspection of the slopes was made in 1995, and a recommendation made that the rockfall hazard should be investigated in detail. Subsequently, consulting reports have confirmed that a rockfall hazard does exist (Newfoundland Geosciences, 1996). The provincial Geological Survey was able to involve Dr. Bruce Jamieson of the Canadian Avalanche Association in further assessments of the slopes with regard to avalanche hazard. Based on the results of his work, and that of the consulting efforts with regard to rockfall (e.g., Golder Associates, 1980, 1992), the City of St. John's constructed safety fences to provide protection from rockfall and avalanche in the Outer Battery with estimated costs in excess of $300 000. Fencing constructed above the Outer Battery in 1998. Reproduced by permission of the Government of Newfoundland and Labrador ©1999.